Beautiful blonde female manager walks through the office, controls the work at modern office, gives direction to colleague. 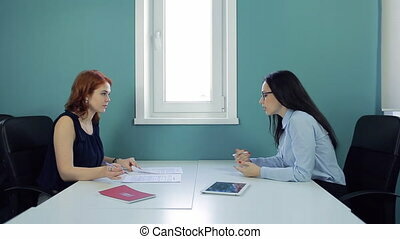 Young team leader talking with employee, puts the documents on a folder. 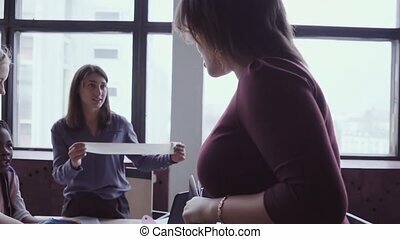 Two beautiful women sign contract at office. At the left the red haired woman is dressed darkly sapphire chiffon blouse. She looks through papers and then gives it for subscription to colleague. Fascinating brunette is clothed in cotton blue casual shirt with black square glasses. 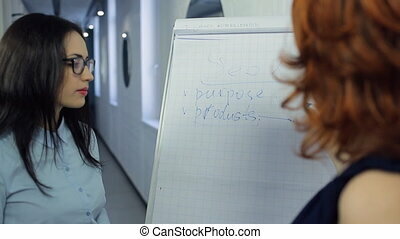 She attentively checks information and appends signature in necessary column. Females work sitting in black leather chairs at big white wooden table on which lie red notebook and white tablet. Woman come to showroom where it is at the door welcome at the dealer. In summer a young beautiful female visits salon, which sells cars. At the entrance to her joyfully meets seller and begins to talk about the services and store promotions. Then he invites her to go to the hall for a presentation. Blonde wearing a black short dress, holding is a square bag lacquer. Staff wearing and strict business attire. On the face of a man with red hair wearing stylish glasses. Nearby are the new machines. End of day in office, women can take personal belongings from lockers. Young brunette woman with long hair, wearing a cyan shirt and sneakers, takes away from personal box to store your bag at end of day. There, she meet her colleague and friend and together they headed to exit of building. In their workroom one of walls separated for cameras to save things while working. All cells are numbered and each has a lock and key with a keychain that you can take with you. 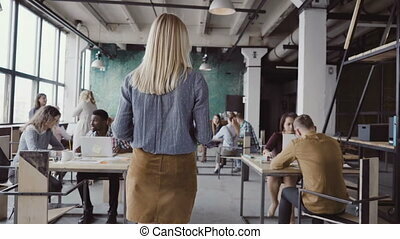 Beautiful blonde female team leader walks through the office, controls the work of employee, gives direction to colleague. 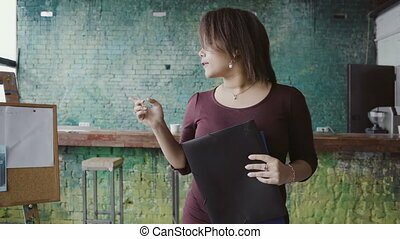 Young manager talking with employee, reads documents and drinks coffee. 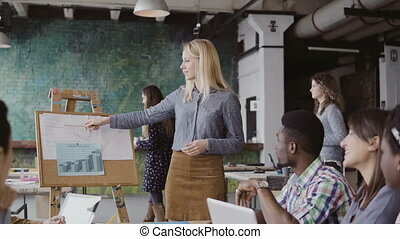 Female blonde team leader walking through modern office and controls work of employee. Female looks the fabric examples. Small clothes design start-up company. Young blonde team leader walking through modern office and controls work of employee. Female looks the fabric examples. Small multiethnic start-up company of clothes design. Young african manager walking through the modern office and controlling the working process. Attractive female comes to designers, looks the fabric examples. Small clothes design start-up company. Beautiful blonde woman manager giving direction to multiethnic team. Creative business meeting at modern hipster office. 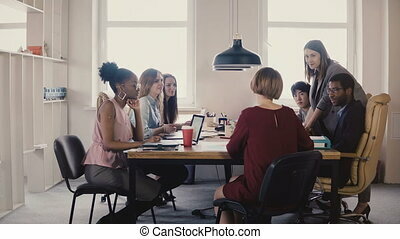 Team leader and mixed race group of people discussing start-up idea. Young african woman getting fired from work at start-up. Female walks through the office, carrying box with personal belongings. Girl leaves mixed race young team after being fired. 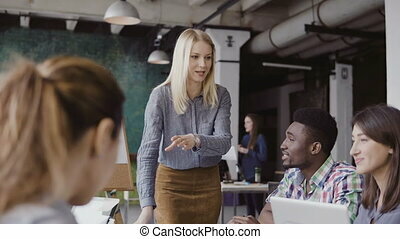 Young beautiful female manager motivates her multiethnic team to work. Team leader presenting financial data at loft office. Creative business meeting of small start-up company. Young beautiful blonde female manager motivates mixed race colleagues to work. Team leader presenting financial data at loft office. Creative business meeting of small start-up company. Close-up view of female manager walking through the office with documents. Woman stands near the table and talks with multiracial team. Group of people clap to businesswoman. Young african team leader walking through modern office and controls work of employee. Female looks the fabric examples. Small clothes design start-up company. 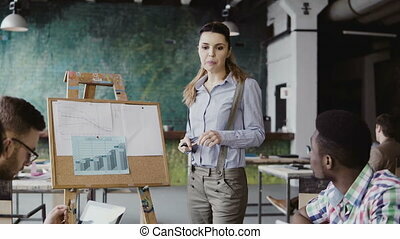 Happy female business coach gives guides to employees. 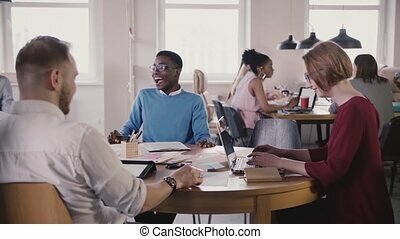 Multiethnic teamwork by the table at office board meeting, panning right 4K. Creative team of young professionals brainstorming together. European female boss gives guides to employees, types on laptop by the table. Multiethnic teamwork at modern office meeting. Creative team of professionals brainstorming together at healthy workplace.